2011 CFMA Nomination for Pocketful of Rhymes! 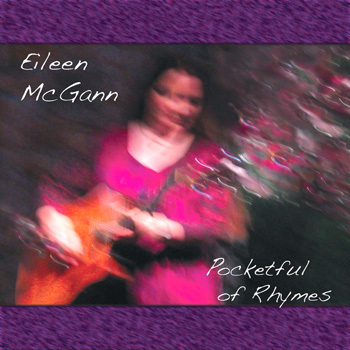 "Pocketful of Rhymes features an eclectic mix of songs that range from hard-hitting political anthems to hair-raising ancient ballads and love songs; from joyous songs of the Canadian wilderness to introspective meditations on the afterlife and the life of a songwriter." Pocketful of Rhymes - "Pocketful of Rhymes features an eclectic mix of songs that range from hard-hitting political anthems to hair-raising ancient ballads and love songs; from joyous songs of the Canadian wilderness to introspective meditations on the afterlife and the life of a songwriter." and pay online by credit card or paypal . Dedicated to all my fellow travelling storysingers. Inspired by a painting expedition in Jasper National Park, by three different dancing rivers: the Athabasca, the Miette and Excelsior Creek..
A tug of war that I go through with myself almost every day. A traditional Irish song in the “eavesdropping” genre. Written the first winter after I moved to Vancouver Island - yes, there are often roses in January. A joyous contemplation of afterlife possibilities. Coming home for me now usually involves at least one ferry. On one foggy journey, I thought about how easy it would be to get totally lost, without navigation equipment and how our ancestors found their way home by the stars, when they could see them. Being Irish, I fell inescapably into metaphor. Based on an ancient Gaelic lyric from the Isle of Man, describing the chaos that ensues when the folk of the otherworld come for you. Thanks to Breesha Maddrell of the Manx Heritage Foundation for help with the Gaelic. Watch out for that Taroo-ushtey! The wars go on, and the culture of mendacity at the highest levels seems to continue without serious challenge. An Irish love song in three-part harmony. A quintessential part of the Canadian experience.